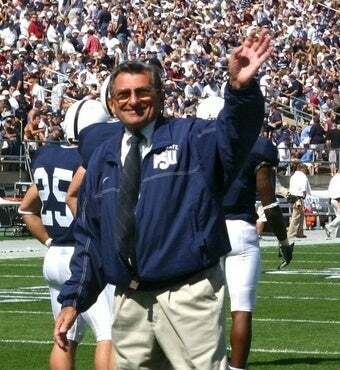 Yesterday, ABC sportscaster Brent Musburger popped by the Dan Patrick show to talk about all things college football and one of the topics that came up was the remarkable success of Penn State this season under 82-year-old head coach Joe Paterno. But then the conversation turned a little grim. Musburger admits to having a personal friendship with Paterno and says that through his candid conversations with JoePa, he knows exactly why he continues to after all of these years. "This is a tough one for me because I have to say up front that JoePa is a dear friend of mine...I'll tell your listeners the truth as to why he still does it. He is fearful — and he looks back at Bear Bryant as the example — he is fearful that he would not be with us if he stepped away. He is a man that doesn't fish, doesn't play golf...he has no other interest other than his family and football. And he's just afraid what would happen with the rest of his life if he walks away from it."